There comes a time in every parent’s life when they realize that it’s okay to give their toddler a little freedom and independence. Sometimes allowing your toddler to do something for him or herself might entail also allowing them to make a mess, but that comes with the territory. That could happen with the Puj Fridge Cups, sure, but they’re also made to be kid-friendly and easy to access. 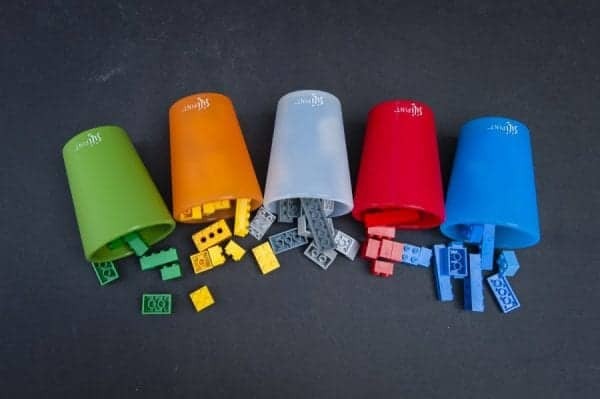 Instead of being stacked together up in a cupboard, the cups come with little hooks that can be put on the refrigerator to allow the soft and squeezable cups to be hung for easy access for your little one when they’re not in use. The 3M adhesive hooks can stick to most surfaces, including stainless steel, glass, tile, and metal, so you don’t even necessarily have to hang the cups on your refrigerator. Instead, you can opt to hang them anywhere that’s easily accessible for your toddler and at eye level. You can even hang one from the bathroom mirror for when your little one brushes their teeth each morning and evening, and since they’re soft and flexible, they’re safe enough for your child to bite down on. If this is a first toddler cup for your child beside a straw or sippy cup, they will invariably bite down, so that’s a bonus to the design of the Puj Fridge Cups. And having hooks on the refrigerator or close by for easy access on your child’s part means that there’s less of a chance of your toddler going through multiple cups per day. Right now, you can find the cups on the manufacturer’s website and Amazon or in-store at in-store at Bed Bath & Beyond. On Amazon, a four-pack of Puj Fridge Cups is $29. Check out the latest price! The cups are made from a soft, flexible, and safe PVC and BPA free material. The hooks that come with the cups can adhere to almost any surface so your child can reach them easily. They’re also completely dishwasher safe, which adds to the convenience of having these cups nearby for your toddler. When you’re ready to move the hooks or take them off of different surfaces, they won’t leave behind any residue. The hanging loop on the rim of the cup is also flexible along with the cup itself. The cups are easy to grip, especially for little hands, which also makes it less likely that they’ll drop or spill them. It’s safe for your toddler to bite down on the Puj Fridge Cups, so you won’t have to worry about your little one hurting him or herself on the rim. The different colors make it easier for multiple children to tell their cups apart from each other. Even if you need to move the adhesive-backed hooks, they’ll stick back to other surfaces with little effort in most cases. Since the hooks aren’t magnetic or suctioned, some parents might not feel as secure with the adhesive backing, mainly if they’re used near a bathtub or other water source. In some cases, the loops on the rim of the cups might break if stretched too far or handled roughly. The material that the cups are made of can sometimes collect dust or lint, which can mean more frequent washing. The Sililkids Siliskin Silicone Cups are similar to the Puj Fridge Cups in that they’re made of a soft material that’s flexible and easy to grasp in small hands. They’re made from 100% silicone and a 100% stainless steel embedded rim while remaining both dishwasher and microwave safe. Although it’s not recommended for children to drink straight from cups that are to warm, it also speaks to the durability of these particular toddler cups. They also have dots decorating the outside of them for further gripping, which will no doubt help prevent most spills from your toddler. If your little one does drop the Silikids cups, they’re durable enough to bounce right back and hold their shape. But because they can’t be shattered or easily cracked as glass or plastic cups might, they’re safe enough to take out of the home and outdoors. They might not have convenient wall hooks like the Puj Fridge Cups have, but they also have similar convenience factors to them. You can find them on the manufacturer’s website and Amazon or in-store at Target. On Amazon, a two-pack of Silikids Siliskin Silicone Cups is $13. Check out the latest price! The ribbed parts on the outside of the cups allow for a better grip for your child. They typically come in packs of two and are affordable for most families, even if you opt to buy more than one pack at once. The stainless steel ring inside the silicone of the lip makes the Silikids cups even more durable and help to maintain shape. They’re also dishwasher and microwave, so you know they can withstand quite a bit. In general, the cups are a bit heavier than other similar silicone toddler cups. At times, there might be a different kind of taste given off with the cups after putting them through a cycle in the dishwasher. Although the rim has a covered stainless steel ring, it might be too hard for some toddlers’ mouths. Like the Silikids cups, the Kinderville Silicone Cups are made from safe 100% silicone. They also have indents on the outside of them for easier gripping from your toddler. The wide base also helps prevent spills, which might be inevitable with little ones, but you’ll need all the help you can get when it comes to your toddler and his or her clumsiness. Even though using open cups instead of sippy cups or toddler cups with straws might be more comfortable for children, but the shape and size of these particular silicone cups make for a more natural transition to big kid cups eventually. And because of the material, the cups will typically stick to most tables or high chair trays without easily sliding or tipping over. You can find them on the manufacturer’s website and Amazon, and on Amazon, a two-pack of Kinderville Silicone Cups is $9. Check out the latest price! At just $9 for a two-pack of the cups, the Kinderville cups might be one of the more affordable options. Since they’re made of silicone, they can withstand most heat like dishwashers and bottle sterilizers. The overall silicone material makes it less likely for the cups to tip over when your baby is using one. You can also fit stretchy silicone sippy cup lids over the top of these if that’s yours or your child’s preference. The lip of the cup might be too thick for younger toddlers to drink from it without making a mess properly. If your little one squeezes the cup too hard, it can make the contents spill out relatively easily. The cups hold shape well enough, but because they’re so flexible, it might result in messes more often than not. While the ME.Fan Silicone Collapsible Travel Cup might not be specifically meant for toddlers, it is more than capable of acting as a training cup to replace any hard plastic cups that your little one may not be ready for yet. The cup can be collapsed for secure storage, and each of them come with lids that stay tethered to each one so you won’t likely lose them. This means that you can easily take drinks on the go for your toddler with a lid tightly closed, or even allow the cups to double as snack containers. But since you can collapse each one down to a much smaller size, you can toss them into your purse or diaper bag to use later on if you and your toddler will be away from home. At this time, you can primarily find the cup on Amazon and in colorful packs of four. On Amazon, a four-pack of ME.Fan Silicone Collapsible Travel Cup is $15. Check out the latest price! Since the cups aren’t made specifically for toddlers, your child can get use out of them for longer than a standard toddler cup usually allows. You can also use the cups to hold snacks for your toddler, which is convenient as the cups can hold several ounces each. It’s easy to store the cups along with their lids, which is especially helpful for putting them in an easily accessible kitchen drawer for your child. They’re soft enough for little hands to hold and little mouths to drink from, even if they’re not made for toddlers alone. When hot liquids are in the cups, they’re even softer and more flimsy to pick up, so it would probably be best to keep them out of the dishwasher too. The different “rings” might make it difficult for your toddler to grip the cup each time properly. The cups are flexible once they’re expanded, but they also might be too flexible, which could lead to messes if your child grips them too tightly. The Silipint Straight Up Half Pint cup is a toddler-proof 100% food grade silicone cup that’s also dishwasher safe and can be squeezed, dropped, and even stepped on without fear of any cracks or rips in the material. It can withstand temperatures up to 450 degrees so that you can put either cold or hot liquids in the cup without any worry. Silipint also sells cups and lids that can fit over the cup to make your toddler’s transition to an open cup that much easier and you can even choose from a variety of colors and prints to give your little one plenty to choose from on any given day. Just one cup comes in a pack, but it’s also durable enough to last your little one for quite a while, while also remaining soft enough for little hands and little budding teeth. You can find it on the manufacturer’s website and Amazon in multiple colors. On Amazon, the Silipint Straight Up Half Pint cup is $13. The silicone is thick enough for the cup to stand firmly on its own, but also soft enough to be put in a jam-packed cooler bag or diaper bag with ease. Since you can purchase lids and straws separately, the cups can grow with your child. It’s safe in very high temperatures, which includes the dishwasher. The silicone makes it easy for kids to grip the sides of the cup while also doing away with the risk of shattered glass cups or cracked plastic ones over time. Even after washing the cups, they might still give off a plastic or rubber smell that could be hard to overcome for some kids. Speaking if smells, there’s also a chance that it will retain the scent of some other drinks you may have poured into it before. After putting the cup through the dishwasher, you’ll probably be left with water spots each time. Choosing the right cup for your toddler isn’t a huge deal. Chances are, your child’s preferences will change every so often anyway. But when it comes down to it, going with a soft and bendable cup made from silicone or something similar is an option you can’t go wrong with. The Puj Fridge Cups add a certain amount of convenience you just can’t get with a lot of other similar cups. While it’s true that you won’t be able to find a proper lid to fit over the rim or a straw that will stay out in the cup, it’s still the perfect option for your toddler who needs to start learning how to initiate getting his or her own drink, or at least his or her own cup each time. It’s also convenient that you can choose to place the respective hooks to each cup pretty much anywhere. The cups are too, for the most part, affordable and accessible to find for most families. Again, your toddler might eventually decide that they would instead use straw cups or plastic ones later on down the road, but you really can’t go wrong with a soft yet durable cup like the Puj Fridge Cup. Chicco MyFit + Booster vs Britax Frontier Clicktight (March 2019 UPDATE) | Which is Better?